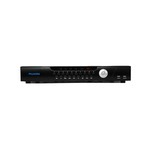 HD-IP Network Video Recorders - PVNVR-1080P-8 - Only $299.95! The PVNVR-1080P-8 is an unbeatable Network Video Recorder (NVR) with an unbelievable price. This powerhouse unit allows you to view and record your cameras in real time both live and online from anywhere in the world, control Pan/Tilt/Zoom devices, and more. The easy to use, easy to setup software can be utilized in browser mode or with the provided client. You can also manage up to 4 NVRs online at the same time! View them individually or all at once, or even pick and choose the most important cameras to view, all from the included software! Central Management Software (CMS) of this type usually costs upwards of $400 or $500 by itself! Don't be fooled by imitators trying to take your money, choose the PVNVR-1080P-8 today. This NVR can support up to 2 Megapixel Camera Resolution.